Whether it’s new construction or a kitchen remodel, a new kitchen isn’t just about looks. As important as they are, quality, size options and functionalities will make it from a kitchen you like into a kitchen you love. 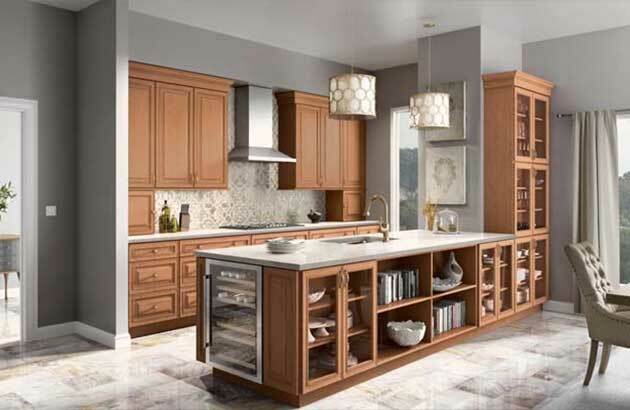 Durability, roominess and good use of space make for a kitchen with long-lasting appeal. A new kitchen or bath can be quite an investment so it’s important to learn as much as you can about the products that go into it. When choosing wood, there are three critical details: Type, color and grain. These set any kitchen apart as unique, since no two trees are alike. Here’s a primer to help you pick the right wood. The grain of the wood, the knots and pinholes, they all tell a very unique story of their former life. Discover what you should expect from products that offer you such a wide range of color, depth and visual interest you can’t get from a man-made product. With cabinets, nature makes the difference.